OZIL IN SHOCK ADIDAS SWITCH? Real Madrid star Mesut Ozil has become the talk of the boot-o-shpere this morning after playing in the adidas Predator LZ whilst in action for Los Blancos last night. Real faced Santos Laguna in a glamour friendly in Las Vegas as part of their pre-season tour last night, with Mesut Ozil lining up within a strong Madrid XI in the sweltering heat. And whilst Ozil’s performance was one he’ll likely forget, boots-fans will definitely remember the occasion for a good long while, as 23 year-old switched his Nike Mercurial Vapor VIII‘s for the new adidas Predator LZ. German international Ozil has been a posterboy for the Vapor line for the past few seasons, having been one of the first to tease the launch of the new Vapor VIII and a key face of the ‘My Time is Now’ summer campaign from the American brand. However, in his time at Schalke, Ozil was a prolific Predator wearer, often pictured in the Predator PowerSwerve – though given this was when he was only 17, there’s a good chance he received his Predators through adidas’ position as kit supplier to Schalke. 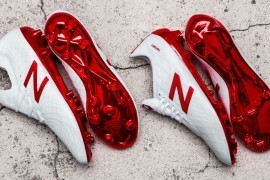 One of the most interesting caveats to the former Werder Bremen’s suspected switch is that he was spotted wearing the Clash Collection Vapor VIII in an open training session at UCLA before the game, which could makes speculation as to whether this was a one-off occurrence even harder. As Ozil’s Facebook page is still decked out in Nike imagery, we’d have to guess that either Ozil had a Thierry Henry-style mishap were his boots didn’t make it off the plane from LA to Vegas, or there was some freak durability issue with his boots that meant he had to hop into a pair of Predators (which, as an adidas-sponsored team, Real Madrid are likely to have at hand) – which would likely mean a hefty fine from Nike for the midfielder. Or this really is the switch of the summer! Ozil’s exceptionally passing ability makes him a great fit for the new Predator LZ, and as a German international, there’s no doubt that adidas would love to snag a triple-threat player who wears the three stripes for club, country and on his boots. Needless to say, we’ll be keeping an eye on Ozil in training – but do you think this could be a permanent switch for Ozil? Special thanks to Ali O for posting this spot up on our Facebook page! Anyone else noticed the Nike exodus of late? Well Germany and Real madrid are both Adidas at the moment, and he is one of Germany’s major stars, so maybe he is going to be Germany’s new Adidas posterboy, taking over from Schweinsteiger? Um, he’s German, adidas is German, and RM is adidas, so no shock here. By the way, he noticed how poor and cheap Nike was getting with their Joker boots en masses. surely if he couldnt have his boots at hand for that game.. a pair of blackout boots would of been better for him.. not some bright blue and red adidas boots. kinda rubs it in the noses of Nike. i think it was just a mishap, since his fb page still has Nike logos. so he will have to pay fine, sadly. 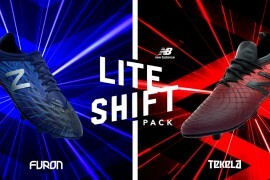 i do agree that predator or ctr360 would be better. Hecan’t do that? And why Adidas? It’s rubbish. And the Mercurials suit him more!!! Could it be he was using MiCoach to monitor his fitness levels in pre-season ? That’s not a real image of him. Look closer to the photo. The image below his knee doesn’t look real. He has Nike sponsorship to fulfill. Although I’d love to see him ditch Nike’s funny looking shoe for real advanced shoes. Adidas is the scientist/Doctor of Soccer. Özil yesterday was wearing a PERSONALIZED pred boot, so it looks like he signed an adidas contract. Nike’s decision is perfect: Modric will force Özil on the bench, also now everybody understands that Özil is not improving his performance compared to last years, gets lost in important matches etc —-> just perfect time for Nike to get rid of Özil and to sign some young, promising player (their usual practice). Fail for adidas.